Bring the honey, vanilla and lemon zest to a boil. Cut the tomatoes in four and add the tomatoes to the casserole. Season with salt and pepper. Leave to cool. Cut Jarlsberg into 1/2-inch slices, place on lightly buttered parchment paper and gratinate under broiler until slightly soft and barely browned. 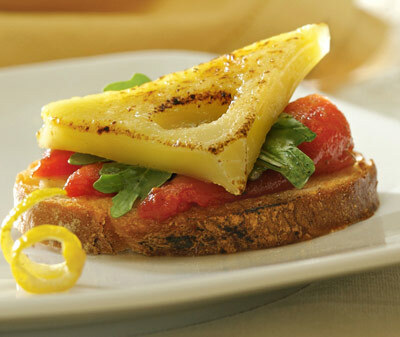 Place some arugula salad on the toast, about 1/4 of the marinated tomato mixture and top with a slice of gratin Jarlsberg. Drip some of the marinade on top before serving.